Rajeev undertook this campaign which began with a face-off with the political shenanigans of the Karnataka State Government whose sole objective was to postpone BBMP elections through the “abuse of court process.” Through this campaign, Rajeev successfully changed the narrative and political discourse in Bengaluru from cynicism and scepticism to one where the real issues are being discussed. The impact of the campaign was widely visible. 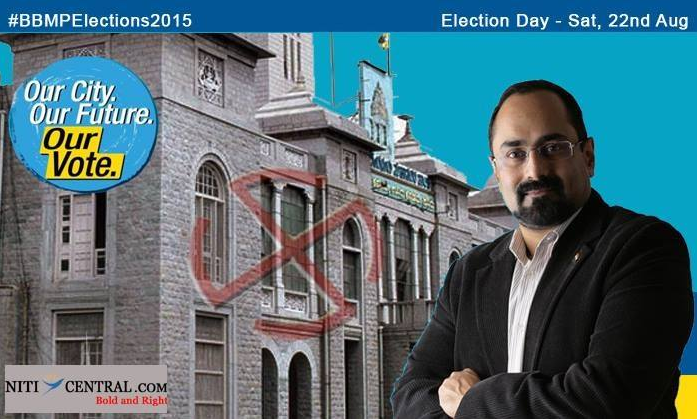 Reforms & integrity become election issues in the BBMP polls. Political parties recognised that they can’t win over the electorate by playing political games or with their usual pre-election rhetoric. All political party candidates took the pledge of integrity & good governance. Many RWAs approached Rajeev and NBF to get associated with the campaign. More importantly, the impact of the campaign was visible with the fact that voting percentage increased by 5% and PM Modi’s BJP, which was endorsed by the campaign, became the single largest party in the council. 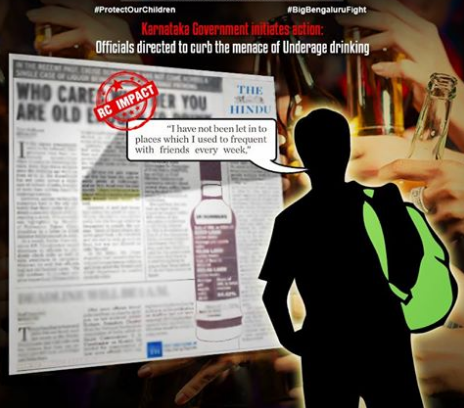 Disturbed by instances of under aged patrons being served liquor at a few high end restaurants, lounges and bars in Bengaluru, Rajeev wrote a letter to the Excise Commissioner highlighting the issue and urged him to ensure stricter enforcement of law and to take stringent action against those found flouting rulesFollowing Rajeev’s letter seeking action against the erring outlets, the excise department commissioner issued directions to officials to randomly check pubs as well as raise awareness in campuses. A detailed inquiry report on the conduct of restaurants, bars and lounges was also sought. Rajeev supported the PIL filed by Namma Bengaluru Foundation for the recovery of the land encroached as indicated in the Reports submitted by the Joint Legislative Committee of the Legislature of Karnataka and the subsequent Report of the Task Force for Recovery of Public Land. The PIL also seeks prosecution of the government officials and private parties responsible for grabbing public lands.It is currently under litigation, with the HC asking the Karnataka government to provide a time bound action plan for clearing encroachments and detailing action taken against errant officials. In January 2014, when a two and a half year old child was brutally raped by her school van driver in Bangalore city, Rajeev wrote to the Home Minister of the State to ensure that speedy justice is delivered He urged the Home Minister to initiate criminal action against school authorities and to set up a Special Court to fast track such cases as mandated under the Prevention of Children from Sexual Offences (POSCO) Act. 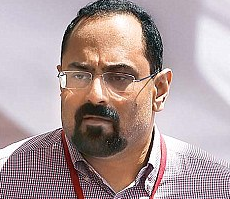 Rajeev also suggested that the government institute a policy to ensure schools follow a rigorous verification process while hiring drivers, janitors and other support staff.to prevent such incidents in the future,Rajeev’s efforts helped in adding pressure on the police to eventually arrest the School Principal and the attendant accused of abetting the crime. 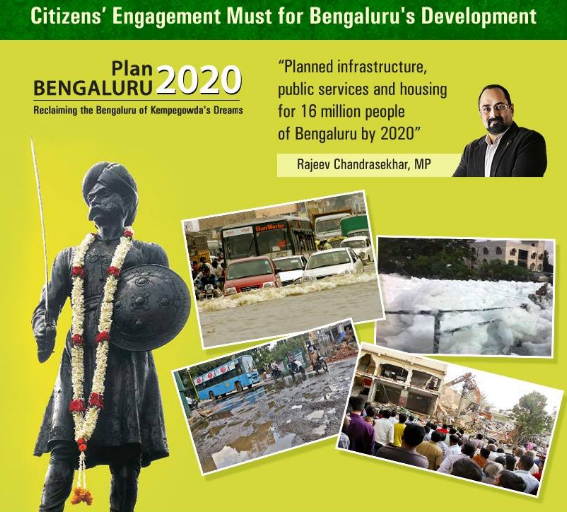 Rajeev raised the need for a vision for Bangalore and long term integrated plan for the development of the city. 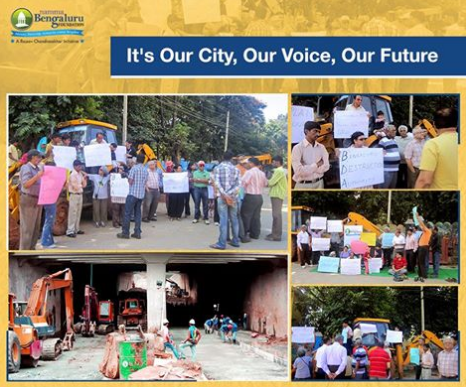 As the Convenor of the Agenda for Bengaluru Infrastructure and Development (ABIDe) Task Force, Rajeev authored PlanBengaluru2020 - a Vision Document and a blueprint for the development of the city to make Bengaluru a world-class metropolis.This document was much appreciated for its vision and planning. The Karnataka Government has accepted the report and promised its implementation. The Government of Karnataka mandated the Karnataka Information and Communication Technology Group Report details 10 key initiatives and recommends several measures for the government to leverage the opportunity and to achieve its core objectives. Among the recommendations, the proposal to increase and implement premium FAR/FSI (Floor Area Ratio/Floor Space Index) as a resource mobilization concept for funding of development of Bengaluru has received wide public attention. Rajeev opposed the recommendations, wrote to Chief Minister urging him to take citizens considerations seriously and protect the city against efforts by lobbies and vested interests. Rajeev’s views received wide spread support from the citizens and a Retired Additional Chief Secretary of Karnataka Government also endorsed Rajeev’s Views on this issue. When Karnataka CM Shri Siddaramaiah issued a statement that Bruhut Bengaluru Mahanagara Palike (BBMP) was facing fund crunch and there is no money available for the BBMP to take up new projects, Rajeev wrote to the Chief Minister stating that Bangalore was not facing any shortfall in revenue but is actually suffering from corruption, wasteful Expenditure & vested Interests and this was the cause, in fact, the main cause for the city’s Municipal authority edging towards bankruptcy. Rajeev highlighted the poor Governance and corruption over the last several years and suggested measures to stem the decline. Although initially few ministers from the Government denied the allegations of Bankruptcy, the Mayor himself wrote to Rajeev, seeking his suggestions and advice to improve the financial condition of the city administration. 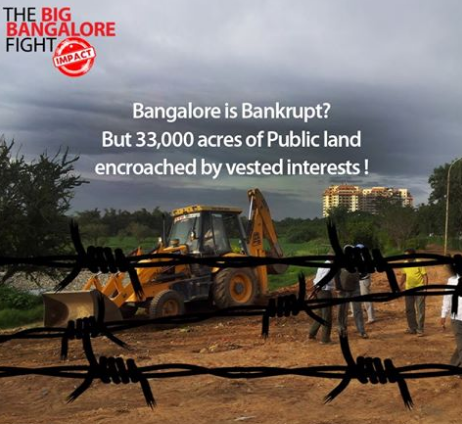 Many media reports revealed the massive corruption in the BBMP and how the intervention of vested interests had caused great damage to the city and its financial state, validating Rajeev’s argument. While supporting a vigilant citizens’ demand on the annulment of the NOC given by HAL to the builder owing to the irregularities and serious breach of procedure, Rajeev wrote to the then Defence Minister Shri A.K Antony drawing his attention to this matter, which if not attended to, would have led to constructions that could have potentially endangered the safety of residents in the area surrounding HAL airport and led to catastrophic consequences. Mantri Techzone, (a private builder) Chalet (builder)’project was located at catchment area of Agara-Bellandur Lake, which falls within the 20 kilometer radius of the HAL airport. HAL had initially erroneously granted an NOC to the builder under the assumption of an incorrect Above Mean Sea Level (AMSL) figure submitted by the private builder. HAL later withdrew the NOC. Rajeev’s efforts lead to HAL revamping the procedures for procuring NOCs to ensure more effective checks and balances. 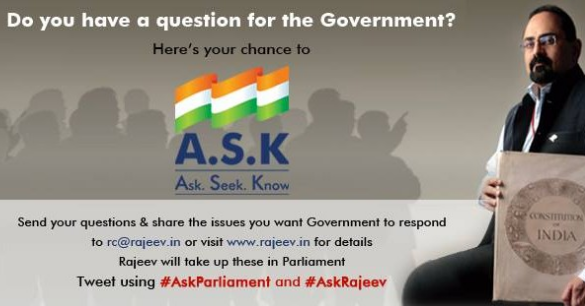 To ensure citizen concerns gets Government's attention, to be their voice in the Parliament and as a citizen’s MP, Rajeev started the ASK initiative and transformed it to a successful campaign.Rajeev’s announcement on ASK in the Public domain – “Do you want to have your voice heard in Parliament? Here is an opportunity. If you have questions you want government to answer or highlight issues that needs government’s response, share them with me at rc@rajeev.in or visit www.rajeev.in for details. I will take these up in Parliament on your behalf” Within a short span, the campaign received over-whelming responses. 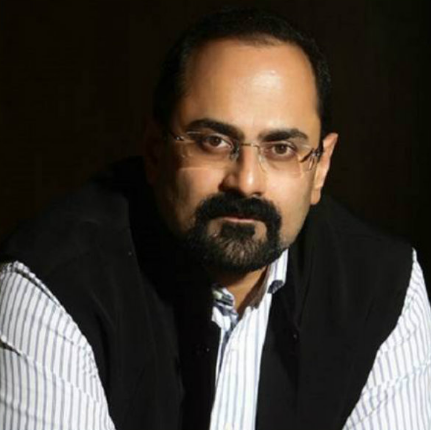 And Rajeev came to be known as a pioneer in such a citizen friendly initiative by any parliamentarian in the country. It is one of the landmark milestone initiative by Rajeev.